. @jim_brunner @dbeekman I never take advice from the Seattle Times. Hey, another good name! I somewhat recently learned how to download Twitter information into the statistical software R. To explore the data and possibilities I figured I should choose an interesting public figure and download their tweets. Who better than former Seattle mayor Mike McGinn? First off, in the interest of full disclosure I am a big fan of Mike McGinn. He didn’t like the eventually troubled tunnel project. He promoted safety and non-SOV transportation mode choices. Go listen to his podcasts they are excellent. (Also, what’s up with MyNorthwest hosting the McGinn podcast? If Dori Monson and Mike McGinn are in the same building doesn’t that cause like a matter antimatter explosion or something?) I always liked when he went rogue and did something because it sounded like the right thing to do — like attempting to block a West Seattle Whole Foods out of concern for living wage jobs — rather than typical political maneuvering like sounding nice and playing nice and doing nothing. 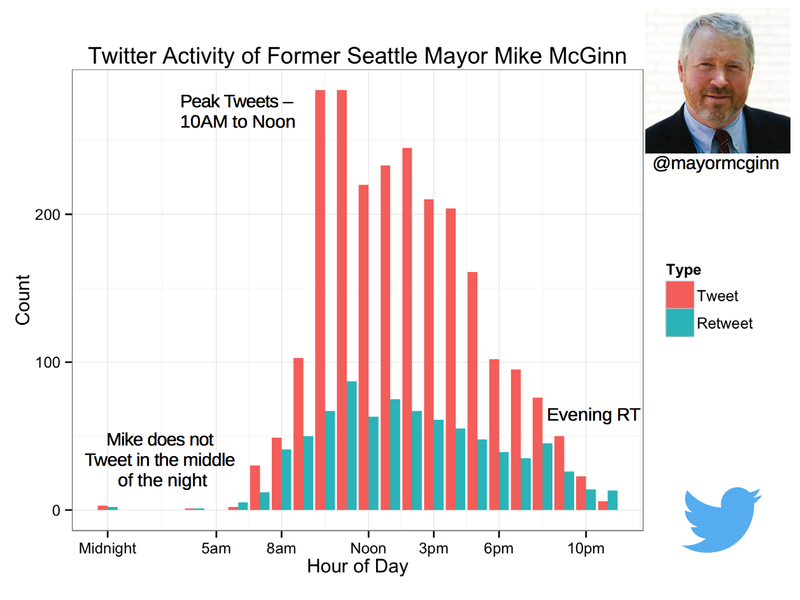 So what can we learn about Mike McGinn from his Twitter activity? Let’s start with a word cloud of other Twitter users most frequently mentioned in Mike’s tweets. 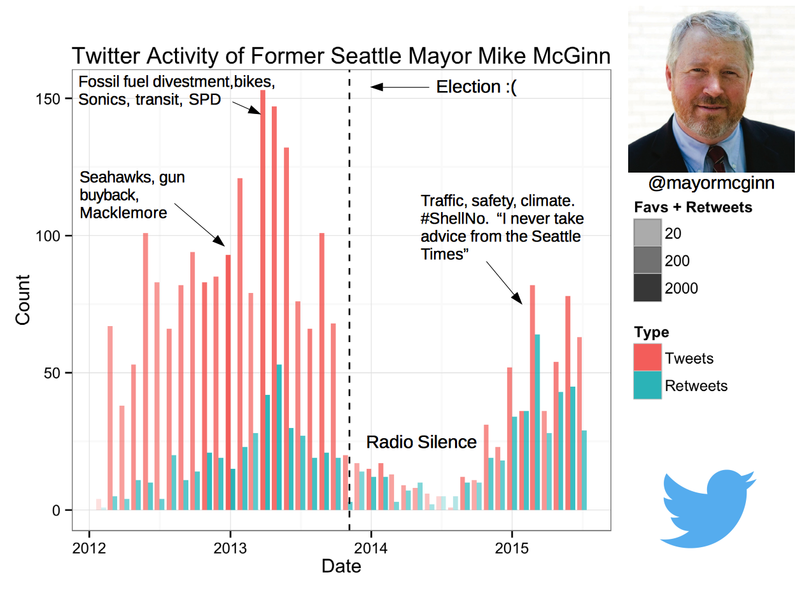 The Seattle Police Department account showed up most often, followed by Bill McKibben, the Seattle Channel, and the Seattle Bike Blog. It’s totally in character for Seattle, climate change, and bicycles to make the top of the list. The next tier in orange includes many of my own personal favorites, such as Seattlish, Sydney Brownstone, and Heidi Grover but is really just a who’s who of excellent Seattle-themed accounts to follow on Twitter. Peripherals are in green and also include a lot of excellent Seattle-themed accounts. I really like that NBA baller Jamal Crawford (@jcrossover) is on there. 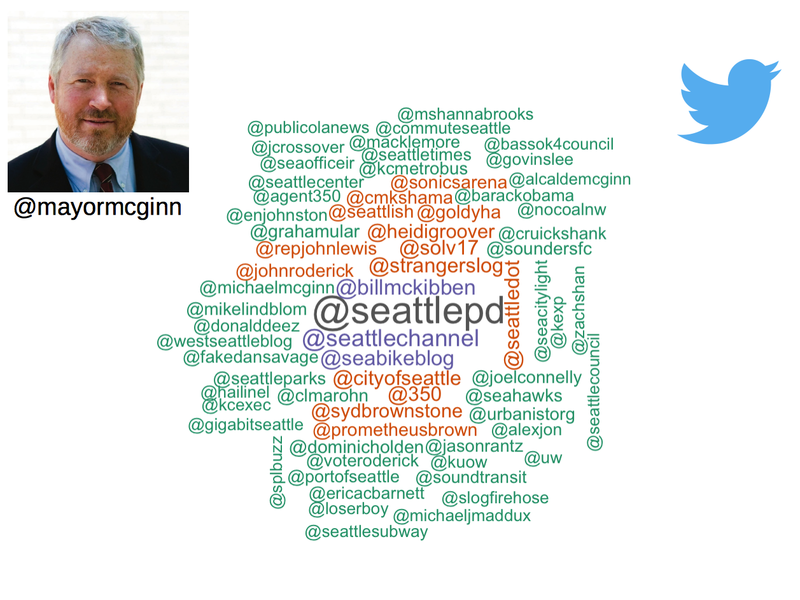 If anything it looks like Erica C. Barnett hasn’t been getting enough Mayor McGinn Twitter love. The same amount of engagement as Jason Rantz?? It’s about time we legalized pot. Prohibition has failed. It’s time for a more sensible approach. Okay, moving on to the more creepy things that Twitter records. So, um, Tweets have time-stamps. This means that you can look at when a person Tweets, which maybe doesn’t sound terribly intrusive until you make a chart like the one below. So much to dig into here. First of all, Mike essentially never tweets between midnight and 5am. Not surprising. He is essentially a business-hours Tweeter, completing a solid amount of social media from 9 to 5. This is a guy who shows up with his lunch pail, punches the time-clock, then checks his smart phone to see what Chuck Marohn has to say about municipal solvency (usually something good!). The last striking feature, at least that I see on this uncomfortably creepy hour-of-day chart, is that in the evening after 8 or so it looks as though the retweet ratio increases: Mike becomes more likely to retweet as opposed to composing an original tweet late in the evening. Finally, here’s the payoff pitch: the time series of tweets by month. What’s heartbreaking about this chart is that you can see exactly where he lost the election. I assume chastened, or just needing a retreat from public life. He almost dropped off the Twitter map in mid-2014, but has since rallied. The annotations on the chart above came from browsing through tweets from different eras and looking for themes. I think Mike’s values align well with the general temperament of the Millenials: promoting walkable, bikeable, safe communities for a better quality of life and mitigating climate change, so it’s heartening to see his voice again after some radio silence. So give Mike a follow and thanks for reading!